Privacy is important to everyone. Nobody wants to have people walking by on the street and staring into their yard or their home. Privacy fences can be a good defense against nosy neighbors and passerby. While some of the benefits of a privacy fence are obvious, there are quite a few that you probably haven’t thought about yet. Shelter from the elements – Privacy fences can help shelter you from some undesirable weather conditions such as wind and too much sun. In the wintertime, the shelter from wind can help you save money on your heating bill. With less wind and cool air to get into the cracks in your home, you will not need to run your heat as hot or as often. During the summer, depending on the positioning of your fence, it can provide shade to your home, which can also help you save on energy costs. Safety – Not only do privacy fences provide the obvious privacy feature, but inherent in that is also the safety feature. 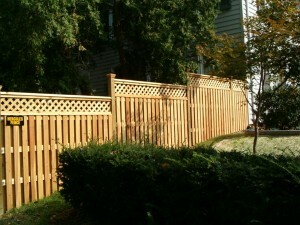 Children and pets are much safer if there is a privacy fence around the property. Kids can play without you having to worry about intruders to your property or the kids getting outside of the property. You can also rest assured that your pets will not be able to jump the fence or otherwise devise a crafty plan to get over the fence. Aesthetic quality – Privacy fences can easily be made to match your garden or your home. When installing a privacy fence, you get to choose what type of wood or material you want, as well as what color stain or paint. These features can add luster and character to your landscaping, if you choose to complement what you already have. If you’re a green thinker, you can also find sustainable materials that will meet your needs. Since Hercules Fence is the largest fencing company in Virginia, we can offer many extra features and options to make a privacy fence fit your needs. When you want to feel secure and comfortable in your own home while potentially saving energy and money, privacy fences are the way to go. Living in Northern Virginia, you know the weather can get rough. Let a privacy fence be your defense system against strong winds and nosy neighbors. As the largest fencing company in Virginia, Hercules Fence can provide you with the best privacy fence in Northern Virginia to keep your business inside and the rest of the world outside. This entry was posted on Friday, October 11th, 2013 at 2:46 pm. Both comments and pings are currently closed.